This entry was posted in America, Politics and tagged politics, Putin, shirtless Putin, Trump, Trump Russia. Bookmark the permalink. I imagine Putin as this loving dad at a family dinner who in between the starter and main course orders an assassination of a spy or the invasion of a small country, all the while balancing his grandchild on his lap. Trump sees the wonderful dad instead of a cunning cold warrior KGB agent. 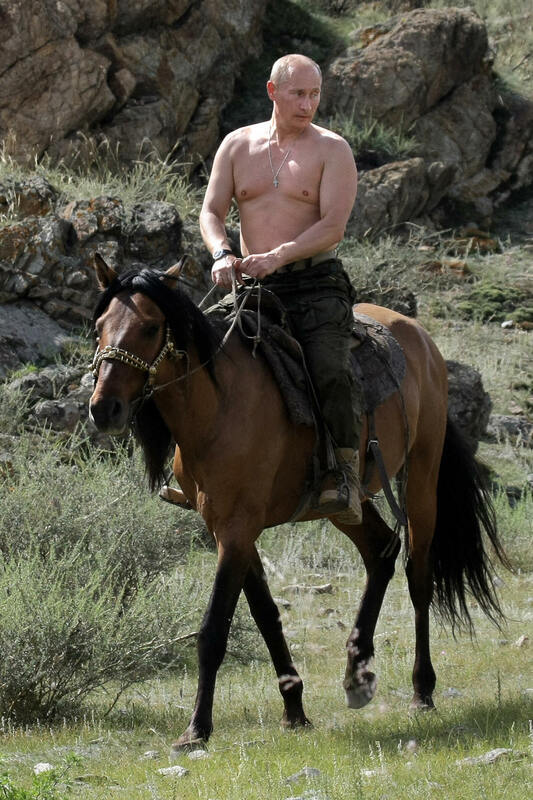 This is how I want to imagine Putin entering the private fuckfest in Helsinki; shirtless, riding a bull peppered with dildos. There is this part of me that thinks, historically, that a lot of the people who have wielded extreme power have been in their own ways, each, very extreme themselves: Putin’s shirtless bravado, dRump’s maniacal egotism, Victoria’s… well, let’s not go there. Despotism, fascism, a lot of these ruling style aberrations don’t arise from minds that are kind to their fellows, they are the results of obsessions and paranoias. In Helsinki the great amateur of world politics met whith the great professional of world politics and the record was as one can expect. All of Putins moves were obviously carefully planned, from the beginning where he had Trump wait for him. It was a dominance show between two animals. Even though the theatrics worked out for Putin who got Trump to eat from his hand, it does not mean anything at all, since Trump can change his mind about what was agreed unlike no veteran of international politics could expect. The comparrison to Hitler may be unfair in a lot of ways, but one thing is similar between him and Trump, and that is how fast they have been able to brake any promises their countries have committed to. The frightening thing about democracy is, that both of their supporters, the billions of people with voting rights thought it was just swell.